When you will go and make an outlandish, rainbow-coloured UN-birthday cake for your own party, it seems only polite to oblige when your beloved asks for something equally as ridiculous and time consuming for their birthday. 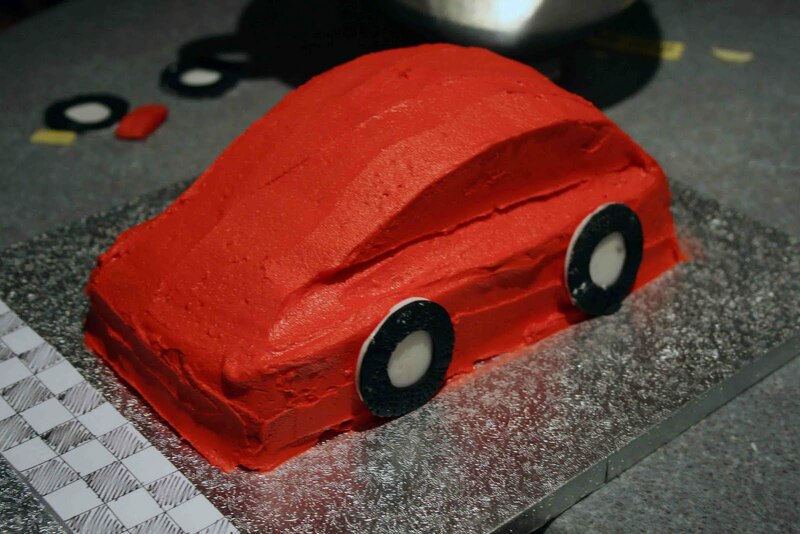 My brief was simple: a red car cake. With jam. 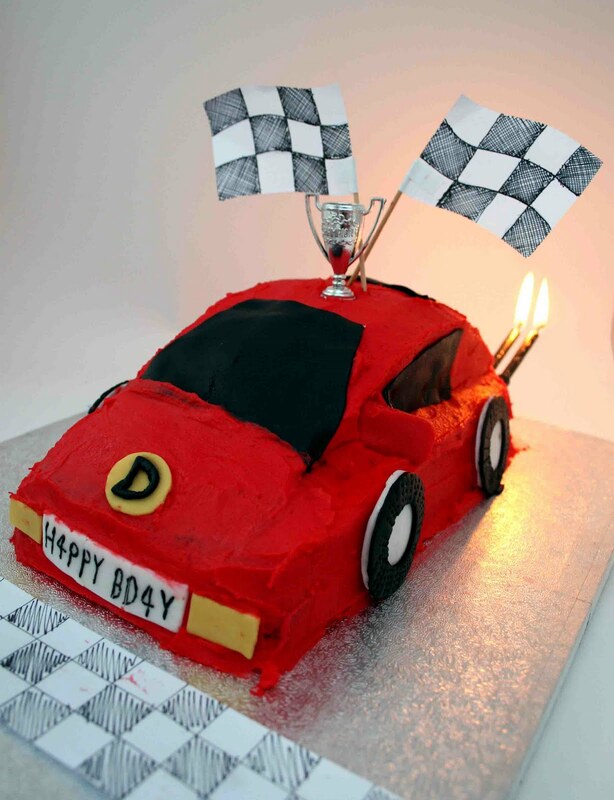 I scoured the internet for car cake tins (thought I could cut a corner – ho ho – here) but was thoroughly unimpressed at the 20-odd-quid price tag. They would also mean no jam, unless I were to start slicing it up which would sort of defeat the point of buying a cake mould. With a bit of inventiveness surely I could do it with what I had in already? Using a remote-controlled car as a template and two slightly differently sized loaf tins I set to work. I used the same recipe as the UN-birthday cake, but only used 1/2 the sponge batter and 3/4 of the icing. 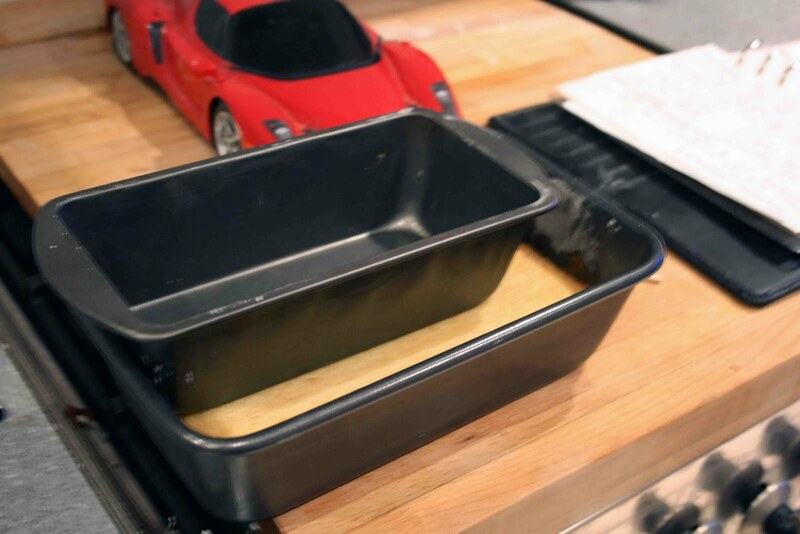 I poured 2/3 of the sponge batter into the larger loaf tin, and 1/3 into the smaller one. (Pictured below is the ‘squodging‘ stage where I pressed the larger cake down when it was nearly cooked so it would be flatter to work with). 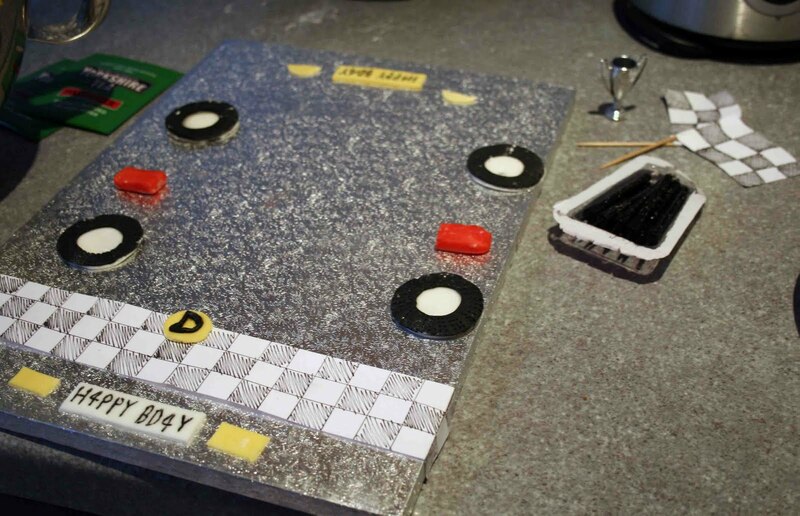 While I waited for my sponge to cool, I assembled my icing accessories (lights, number plates, wheels, wing mirrors, car badge), cake board with finishing line, chequered flags (made from cocktail sticks), trophy and candles (for the exhaust pipe). 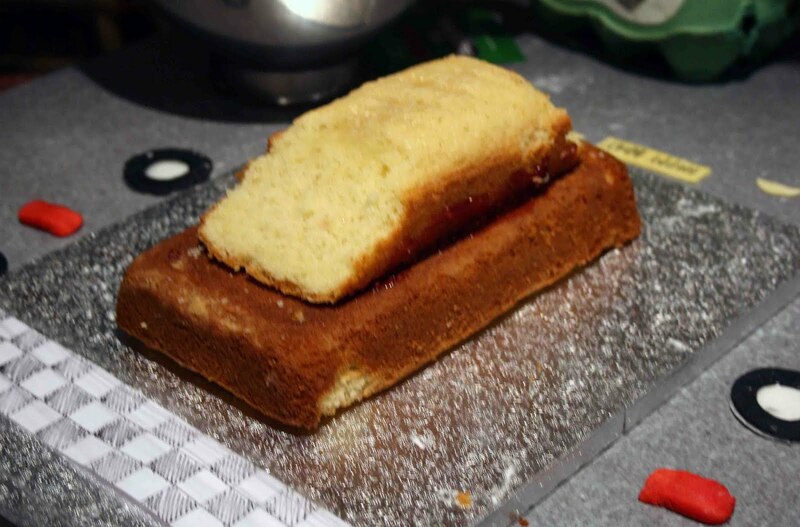 I sandwiched the sponges with jam (only the top sponge needed a little cutting with a very sharp knife). 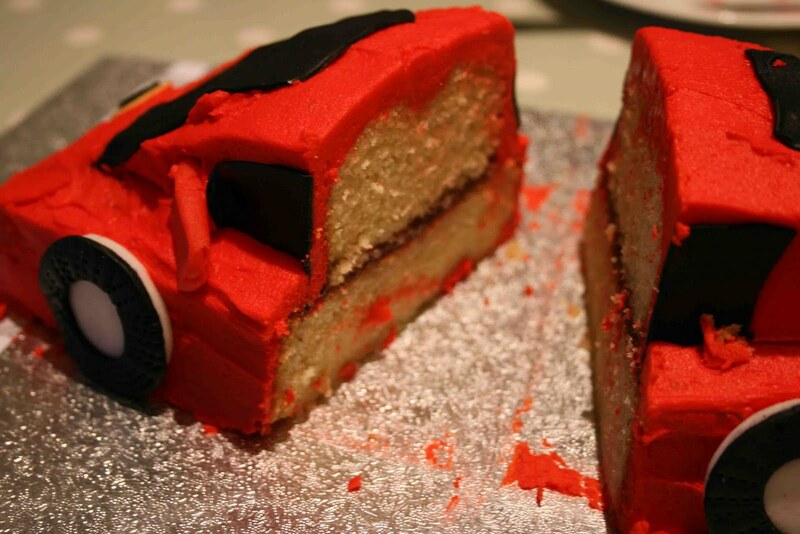 Then smothered the whole thing in a LOT of red icing, and started to add the pre-coloured roll-out icing accessories. And TLM had three slices of it for birthday breakfast. Wonderful! I hope TLM had a great birthday. I think it looks yummeeeee! I love your cakes! I hope that TLM had a very happy birthday. It’s obvious he enjoyed the cake!